Security Headers and SSL Labs both assign a letter grade. Security Headers however will give points for the use of any header regardless of how it is used, so I have reduced the score in two places for ineffective implementations of Content-Security-Policy. Sites can apparently request exemption from SSL Labs scanning; Citibank has done this so I will reduce their SSL Labs score to an F.
Before I started I assumed that DMARC would be pretty much pass/fail but Bank of American interestingly had it set to quarantine for all subdomains but not for their root bankofamerica.com domain where they actually send email from, I’ll give them a D.
It is shocking to me that so few banks support two factor authentication in any form for consumers. 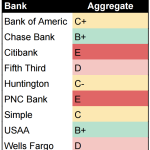 In the end the results show that nobody is perfect but Chase Bank and USAA stand above the rest. 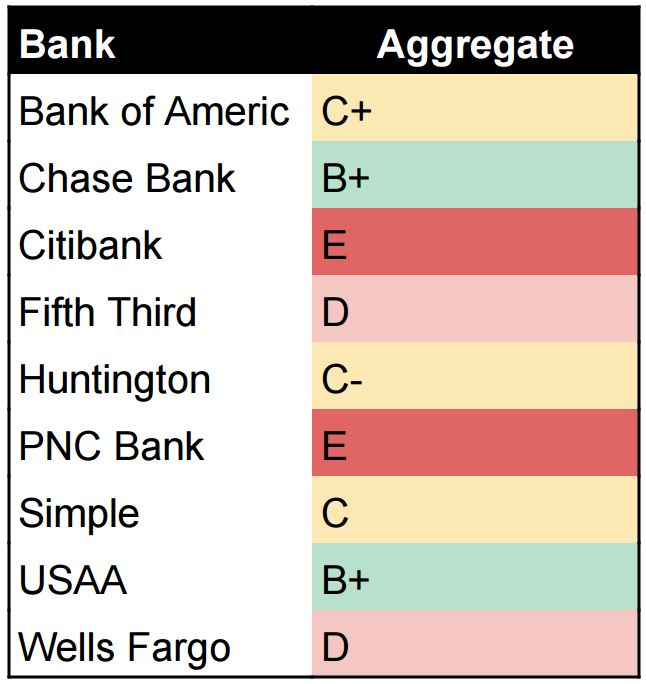 Although this is not a wholistic review of the security programs at these banks, these outward facing security policies give us a window into how these banks value customer security.